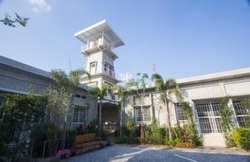 The outward appearance of the Udongreenville Hotel is quite reminiscent of a prison, with what looks like a watchtower positioned in one corner, and a number of metal gates scattered about, but the accommodation is far from that. 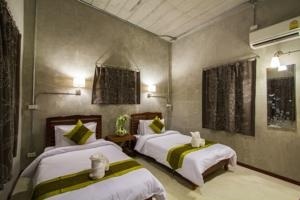 As the name of the hotel suggests, green is a consistent colour theme throughout, but it has been done rather tastefully. 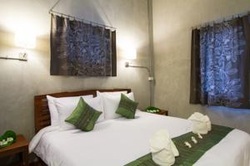 It is also worth noting that as far as customer reviews are concerned, with an average score of 8.8, Udongreenville would appear to be one of the best hotels to stay in Udon Thani, and for a 2 star hotel, that is quite a boast. Located about halfway between Nong Prajak Park and Central Plaza, Udongreenville gives you the best of both worlds in being close to each area, but far enough away to 'escape'. Each location is about a 15 minute walk. Udongreenville offers clean and comfortable rooms with garden views and the convenience of on-site parking and a laundry service. Free Wi-Fi is available throughout the resort. 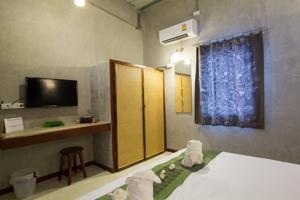 The cosy rooms are equipped with air conditioning, flat-screen cable TV, a refrigerator, and a seating area. En suite bathrooms are fitted with shower facilities. The resort serves complimentary bread and coffee from 6.00am to 10.00am. For meals, you can sample a variety of local cuisine served at many restaurants located within a 5 minute walk away. 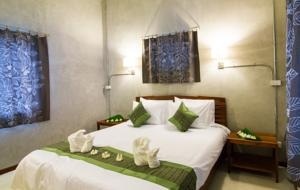 Rooms cost from about 800 baht a night.